VILLEFRANCHE, FRANCE / ACCESSWIRE / January 8, 2019 / There'sno mystery in how the earliest of human race survived and lived without having money as a medium of exchange. They bartered. Despite the problems that the barter system has had, like the matching of wants and indivisibility of goods, humans learned to live with one another in the absence of a government or 'trusted' third parties. Money came into existence as an answer to the issues that this system put forward. We have spent several years trusting and believing in pieces of papers that neither have an intrinsic value nor are backed by an asset. Why do we continue to do so despite the widely damaging financial crises over the years? Well, primarily because of a lack of an alternative. However, today we have an option with us, one that empowers everyone alike and is inherently decentralized. Yes, it's cryptocurrencies. After evaluating and understanding the deep-rooted merits that such digital currencies behold, the ShareMeAll project has been launched with a vision to enable uninterrupted sharing. This sharing traverses beyond borders and empowers humans from one part of the world to share objects, services, experiences, and spaces. Imagine, you could live in Singapore, own a home in London, share it with an Indian, and the best part- earn from it. All this, without any involvement of trusted third parties or Center-backed currencies. All this is made possible by the use of ShareMeAll token and the underlying technology of blockchain. The use of eSwitch® tokens allows people to go back to bartering and secure monetary gains in the process. While the receivers will be able to leverage all imaginable things and services without actually buying any of them, the lenders will be able to share within the most trustable, secure, and transparent ecosystem. What makes ShareMeAll the most efficient platform for simple exchanges is the ease in processes. 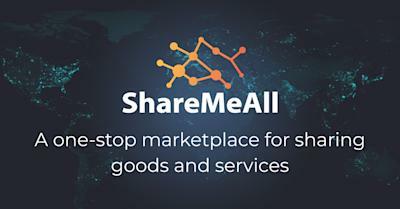 The new ShareMeAll marketplace and mobile exchange platform will be accessible to everyone around the world and all one needs to do is register. Once a user registers, he or she will be able to participate in some incredibly fascinating barters with just a few clicks. The Ethereum-based eSwitch® tokens are up for presale and all set to commence a steady and smooth exchange of goods, services, and even accommodations. Given how creatively this project brings back trust among humans and eliminates the need for money all together for facilitating exchanges, it has been receiving a promising response at a global scale. With absolute autonomy, trust, savings, and accuracy, ShareMeAll holds immense potential for the entire human race.